The following notes cover two separate trips from the San Francisco Bay Area to the Central Coast wine country, during late April and early May. First up…..a quick three-day trip to Santa Barbara County with my friends Jane & Danny to visit winery open houses during the Santa Barbara County Vintners' Festival weekend. Jane & Danny live in San Francisco, but had been visiting friends in the Los Angeles area during the week before the Vintners' Festival. We both made early starts on Friday morning to meet Dave Corey at the Central Coast Wine Services facility in Santa Maria. It's an adventure tasting through barrels with Dave Corey – he's got so many different lots and different types of barrels to choose from. I've tasted with Dave on a number of occasions and it's always a different experience. You never know what he'll feel like sampling on a given day. I had tasted a few of these wines late last year, but of course five months later they've changed a good deal, and it's always fascinating to taste how wines develop over time in the barrel. Leaving Santa Maria, we drove south to begin our tour of the many winery open houses during the Wine Festival weekend. Our first stop was at the winery shared by Ampelos Cellars and Ken Brown Wines in Lompoc. Peter & Rebecca Work were pouring their wines at the busy open house. The new Viognier, done in stainless steel, had apricot / peach aromas with a hint of flowers, and crisp acidity – a delightful wine. The "Epsilon" bottling will be a special small-production wine and will vary from year to year. This year's Epsilon Grenache featured bright strawberry fruit with enough stuffing to age nicely. Ken Brown was pouring new releases and a few older wines. The Pinots are the stars here (I thought the '05 Santa Barbara County bottling was showing especially well – dark fruits, spice, great mouthfeel), but the other wines aren't far behind. Very good wines across the board – well-focused flavors and good balance seem to be hallmarks of Ken's winemaking style. Melville's much-anticipated Inox Chardonnay is always released on Wine Festival weekend. The tasting room was pouring all of the current releases and had a fine selection of cheeses for their open house as well. The Inox Chardonnay (all stainless steel, no malolactic fermentation) was crisp and minerally as usual, and the "Terraces" Pinot Noir, with cherry fruit, earth, spice, and good structure for aging, was my favorite of Melville's '05 Pinots. Another pioneer of Santa Barbara wine, Rick Longoria was hosting a rare open house at the winery's facility in the Lompoc "Wine Ghetto". Pouring a number of the current releases, there were several highlights – especially the delicious Bien Nacido Vineyard Pinot, which featured focused cherry aromas, spices, well-integrated oak, and a long finish. Continuing our tour of the Wine Ghetto, we next visited Palmina. 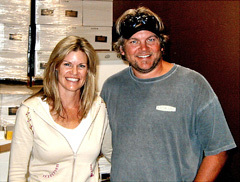 Steve & Chrystal Clifton make what is arguably the best lineup of wines made from Italian grape varieties in California. While the reds are very good, I think the white wines are the real stars here – the Pinot Grigio had pleasant stone fruit and melon aromas, a touch of spice, and lively acidity. While the wines are tasty on their own, it's clear that they are made to be enjoyed with food. We finished up our Wine Ghetto visit with a stop at Fiddlehead, where Kathy Joseph makes some fine Sauvignon Blancs and Pinot Noirs. Her Sauvignon Blancs can age very well, as was evident from a couple of older vintages that were being poured at the open house. The '05 "Gooseberry" Sauvignon Blanc reminded me of the top New Zealand versions of the wine, very yummy! Visiting Santa Barbara County's Pinot pioneers seemed to be the theme for the day (having already tasted at Ken Brown's and Rick Longoria's wineries), as we stopped at Richard Sanford's Alma Rosa winery in Buellton. We were delighted to hear that Alma Rosa will soon be moving their tasting room from their current "Camp Alma Rosa" location to the old Sanford tasting room on Santa Rosa Road. The whole lineup was very good, with the lightly floral, zingy Pinot Gris and dark, complex La Encantada Pinot Noir were my favorites of the bunch. Foxen always seems to be a popular destination, judging by the always-busy tasting room, and this day was no exception. We did manage to find a rare time when the wind was nearly non-existent (the winery is situated in a windy spot along Foxen Canyon). The citrus aromas, smooth mouthfeel, and crisp acidity of Foxen's Chenin Blanc makes this wine a consistent favorite. We stopped in at the Andrew Murray facility in "Area 51", past the oil rigs near Firestone Winery, for their always-fun open house. Since the old estate vineyard was sold last year, new vineyard sources are being used, so it will be interesting to see how this may affect the wines over the next few years. Andrew and his family poured the wines at their open house, and the sausages, pizzas, and other food was delicious. While the reds are more consistent than they were a few years ago, I still think the whites outshine them – both the Viognier and the "Enchanté" blend were very good. A visit to Santa Barbara wine country is not complete without dinner at the Hitching Post. We were joined at the restaurant by Peter Cargasacchi, whose informative and entertaining musings were a fine accompaniment to our meal. Peter is one of the few people I know who makes more sense the more he drinks…….or maybe he just makes more sense the more I drink! '06 Bien Nacido Syrah, Estrella clone, 5% Viognier, new barrel: meaty, blackberry, moderate tannins but smooth mouthfeel. Just one barrel produced, the wine will be called "Bona Fide"
'05 Bien Nacido Syrah "Skywatcher": rich blackberry fruit, some meat and oak notes, touch of spice, moderate tannins, great acidity, excellent wine that should age well. This is from the two rows of fruit that Paul gets from Bien Nacido. We had made an appointment to taste with Paul Lato at Central Coast Wine Services in Santa Maria, where he makes his wine. We coordinated our timing so we could taste along with a group visiting from Southern California. Paul is now up to the astounding total of 16 barrels from the '06 vintage – a 60% increase from his '05s! We started with barrel samples of 2006 wines, tasted along with Paul's inimitable collection of stories. One memorable story concerned how Paul had heard that Jean-Louis Chave would always wait until a particular chestnut tree at his vineyard in Hermitage would begin to drop nuts on the ground before he picked his fruit there. Paul recalled this when deciding when to pick Pinot Noir at Gold Coast Vineyard. He waited for walnuts to start dropping from a large tree next to the vineyard before he picked the fruit there, and he's very happy with the results. Following the barrel tasting, Paul brought out a lunch he had generously prepared for all of us, and he began opened bottles of some of his '05 wines. As we tasted the wines, I asked Paul whether he does any whole cluster fermentations. He replied that no, he destems all his fruit…..except for five clusters of Syrah! Whatever he's doing, it certainly works – Paul's wines display a wonderful balance between intensity and elegance. This open house is a "must" during the Vintners' Festival weekend. Only open to the public twice a year, this event attracts a big crowd. My friends and I always seem to run into someone we know there – this year it was James Ontiveros, who we spotted as we were leaving. Overall, I didn't think the ABC Pinots being poured were as strong across the board as I've had in some other years, but the '04 Knox Alexander was outstanding. Most of the '05 Qupé Syrahs were quite tasty (the Bien Nacido was my favorite), and both the Verdad Albariño and the Rosé should be exceptional summertime wines. We decided to make one last stop before heading back to the Bay Area, so we drove along Santa Maria Mesa Road the few miles to Cambria. They were pouring some of their more basic wines for the open house, and several struck me as very good QPR wines for everyday drinking. The '05 Julia's Pinot Noir was one of the best sub-$20 Pinots I've tasted recently – medium-bodied, cherry-cranberry flavors with some spice and earth notes. Following our visit to Cambria, Jane & Danny and I went our separate ways as we all made the long drive back to the Bay Area. Less than a week later, I was on the road again, this time for a full week of wine fun, culminating at Hospice du Rhône in Paso Robles. I started out on Saturday morning to the Pinnacles Wine Festival. Hosted by the Inn at the Pinnacles in the Chalone AVA, high in the mountains east of Salinas Valley, this event featured about a dozen wineries that produce wine from the area, along with exceptional food from a number of Monterey County restaurants. I was helping to pour at the event for Harrington Wine, where I work part-time, and which makes a Pinot Noir from Brosseau Vineyard. During breaks from pouring, I was able to taste most of the other wines at the event. There were some excellent Pinots, Syrahs, and other varieties, but what impressed me most of all were the Chardonnays. I'm not normally a big fan of California Chardonnay, but nearly all the ones I tasted from the Chalone AVA displayed a pronounced mineral character that was quite distinctive. Maybe there really is something to that limestone soil….. Continuing on to Paso Robles after the wine festival, I had dinner at Artisan Restaurant, open for barely six months and already becoming a favorite. I was joined by Al Osterheld (who had been tasting at the Pinnacles Wine Festival), Raquel Rodriguez (I keep missing Augie at these dinners! ), and Larry & Nona Speak. Larry & Nona own Nona Vineyard, west of Highway 101 in San Miguel, where they grow Syrah and Sangiovese. Their fruit goes to Santa Barbara Winery among others. Since neither Al nor I had anything scheduled on Sunday, we decided to head south from Paso to stop at a few tasting rooms. We visited about a half-dozen of them, some more notable than others. The shared tasting room of Tensley and Carina in Los Olivos and the Ballard Inn tasting room in nearby Ballard were the highlights. After driving to Los Olivos, Al and I thought we'd see if the Tensley tasting room was open, and sure enough, Joey Tensley was behind the small bar. We tasted through his current releases as well as those from Lea Wines, made by Joey's wife Jennifer. The "Camp 4 Blanc" white blend and the Reeves Ranch Syrah were my favorites. The Blanc had green apple / stone fruit aromas, with mineral notes and crisp acidity, while the Reeves Ranch Syrah had an intriguing mixture of warmer-climate fruit aromas, flavors, and richness, along with an intense black pepper character usually only found in cooler-climate Syrahs. Carina shares the tasting room with Tensley, and the wines are made by Joey Tensley. My favorite was the "7 Percent", and it was interesting to compare that wine, made with Syrah from Colson Canyon vineyard, with the Tensley Colson Canyon Syrah – the Carina was leaner and more peppery than the Tensley in addition to showing floral hints from the Viognier component. It's always fun to stop at the Ballard Inn on a Sunday afternoon, when Barry Rossum is behind the small tasting bar. As usual, Barry was pouring a number of interesting wines, with several notable ones. The Lane Tanner Julia's Vineyard Pinot had ripe cherry / raspberry aromas with a bit of earth and smoke, and the Kenneth-Crawford "Blue Fin" Syrah showed intense dark fruits with a touch of pepper and other spices, and a rich mouthfeel. After saying goodbye to Barry, Al drove back to Paso Robles for the night while I continued south to Buellton. '06 Ashley's Pinot Noir: tasted from several barrels, all displayed dark cherry / plum fruit, some pretty floral notes, and moderate oak. '05 Camp 4 Vineyard Mourvedre: plummy, earthy, a bit of oak, fairly tannic. This will be part of the Epiphany "The Gypsy" blend. On Monday morning we met enologist Larry Schaffer at the Fess Parker facility in Santa Maria, just around the corner from Central Coast Wine Services. He has been at Fess Parker since harvest 2005, part of the new winemaking team there. Larry invited us into the wine lab, where he talked with us about the Fess Parker and Epiphany labels. 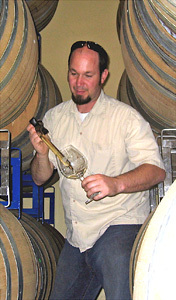 Fess Parker core varieties are Chardonnay, Pinot Noir, Syrah, and Viognier, and they make some small-production wines including single-clone Pinot bottlings (such as Ashley's 115 clone). Epiphany was started by Fess' son Eli, and focuses mainly on other wines, mostly Rhône varieties. Reds are fermented in the Fess Parker winery outside of Los Olivos, and the whites in Santa Maria. All longer-term barrel aging is done in Santa Maria. The whites get a combination of stainless steel and barrel fermentation. All reds go through a cold soak prior to fermentation, and a number of cultured yeast strains are used for both reds and whites. They use mostly French oak with some Hungarian oak on Pinots, and some American oak on some other reds. They are experimenting with whole cluster fermentation of Pinot (up to 25%) in some small lots. While Fess Parker is making a number of larger-production wines aimed at the broader wine market, both that winery and Epiphany seem to have made a renewed effort to push up the quality of their smaller-production wines. Fess Parker winemaker Blair Fox, along with the fairly new winemaking team of which Larry is a part, are making strides toward greater recognition for their recent wines. And in fact, shortly after our visit, one of Fess Parker's Syrahs, the '04 "Big Easy", placed third out of 45 wines in the annual "Syrah Shootout" preceding Hospice du Rhône. This event is a blind tasting, with the wines judged solely by the winemakers themselves, so that was an impressive showing. Overall, Fess Parker & Epiphany have a promising group of wines in barrel, and it should be interesting to taste how they all turn out. From Santa Maria, Al and I headed south to grab some lunch in Los Olivos. While in town, we met up with Brad & Maureen Harrington, who joined us as we continued on our winery and vineyard expedition. '05 PMV Grenache: mostly Tablas clone, some Alban clone, with 22% Syrah blended in: medium-dark, sweet wild berry aromas, nice acidity, moderate tannins. We arrived at Beckmen Vineyards, just outside the town of Los Olivos, and quickly spotted Mikael Sigouin outside the barrel room. 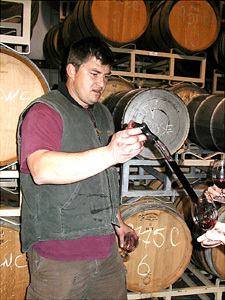 Mikael had worked as assistant winemaker at Beckmen in the past, and returned recently to become their winemaker. We'd arranged to taste some barrel samples with Mikael, and while we waited for him to finish with some work, we headed into the tasting room to check out Beckmen's current wines. As Mikael had not yet come by the tasting room, we decided to walk back to the barrel room where he was helping to clean up some equipment. It was just a few more moments before he was ready to guide us through some barrel samples from Beckmen's 2006 vintage. Winery owner Steve Beckmen joined us partway through the barrel tasting, and afterwards he invited us to take a look at some vineyard rocks he'd recently collected, showing the different character of two portions of the Purisima Mountain Vineyard. 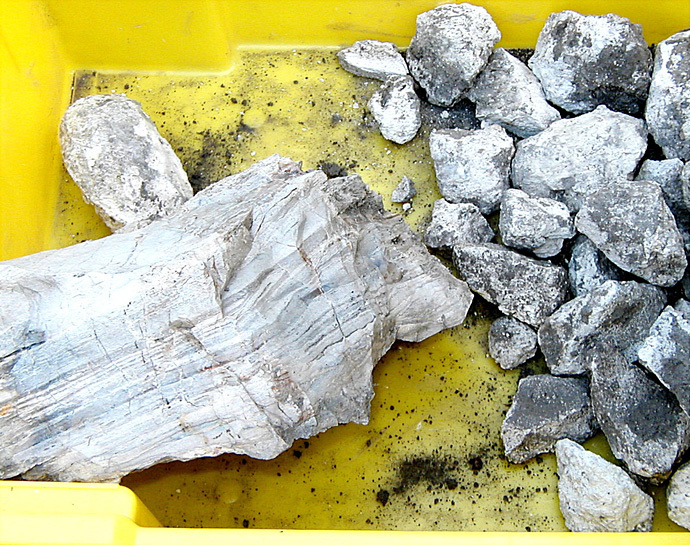 A large rock from the Clone 1 section of vineyard was solid and showed distinct striations, while the rocks from Block 6 were rounder and chalkier, considerably less dense than from the other portion of the vineyard. In addition to being the winemaker at Beckmen, Mikael Sigouin also makes wine for his own label, Kaena. We walked with him over to another barrel room at the Beckmen facility to taste a few of his wines. After our tasting with Mikael, we had a little while to rest up before our next meeting – Monday burger night at Hitching Post with John Tomasso and Peter Cargasacchi. Mmmmmmm…….HP burgers. Tuesday morning we all met at Ampelos Vineyard for a tour with Peter Work and then some barrel tasting at their winery in Lompoc. We also visited a new vineyard that Peter is assisting with planting, located between Sea Smoke and Mt. Carmel vineyards. It will have Pinot on the upper slopes and Chardonnay further down. I'd visited Ampelos Vineyard late last year, but it was interesting to see it again with the vines now pushing their new growth for this year. We stopped to look at a number of spots around the biodynamically-farmed vineyard, and watched Peter as he showed us the "branchlock" clips – installed in some of the Pinot Noir rows – that keep shoots growing more vertically and evenly than in the other parts of the vineyard. Newer Pinot Noir plantings have some interplanted Pinot Gris. Leaving the vineyard, we drove the few miles west into Lompoc to the Ampelos winery to taste some barrel samples of their '06 wines. As we tasted, Peter talked a little about his winemaking techniques. Reds undergo a 3-4 day cold soak, and are inoculated with a variety of yeasts – mainly Assmanshausen, RC212, BM45 for Pinots, and VQ15, D254, RC212 for Rhônes. We tasted Pinot samples from two neutral barrels to find out if we could notice a difference between wines made from branchlock vs. non-branchlock vines in same vineyard block. We did find some distinctions, though it would have been nice to have tasted them blind. Ampelos Cellars is one of the rising stars of the Sta. Rita Hills AVA, and it seems likely that the wines will only get better in the future. '06 Pinot Blanc (12.5% alcohol, combination of early and late picks at the vineyard): very light color, pear / apple / tropical fruit aromas, still going through malolactic fermentation (and displaying some characteristic banana aromas from that). '06 Pinot Noir, Pommard clone: darker fruit aromas, lots of acidity, will be blended with 777 clone for "Cuvée Sandra"
'05 "Constantine" (46% Mourvèdre, 40% Grenache, 13% Syrah, 1% Viognier): dark color, complex earth, meat, herbs, and dark fruit aromas, medium-rich mouthfeel and moderate tannins, very nice! Following a pleasant lunch at Sissy's Uptown Café in Lompoc (another one of John Tomasso's recommendations – he's never steered me wrong on restaurant tips), we headed for our next appointment at Demetria Estate, located at their beautiful winery – formerly the Andrew Murray facility – above Foxen Canyon Road. We were met by winemaker Michael Roth, who had worked most recently at nearby Koehler Winery, as well as at Grgich Hills and Saddleback Cellars in Napa. Demetria owners John and Sandra Zahoudanis bought the Murray property in 2006. They had previously bought Ashley's Vineyard, near Lompoc, though they recently sold it to Foley Estate Winery. (Ashley's has undergone a confusing series of name changes: Demetria renamed it Gaia vineyard although other wineries buying fruit from there continued to call it Ashley's, and Foley intends to rename parts of the vineyard Lindsay's and Courtney's, after William Foley's daughters.) Demetria gets Pinot Blanc, Pinot Gris, Chardonnay, and Pinot Noir from Ashley's Vineyard. The old Andrew Murray estate vineyard, now renamed Demetria, produces Marsanne, Roussanne, Viognier, Grenache, Mourvèdre, and Syrah, and is being farmed biodynamically. The winery uses a EuroSelect destemmer (the same unusual piece of equipment I'd seen earlier this year at Breggo in Anderson Valley), and reds go into two-ton stainless steel fermenters, which are set up to allow for submerged caps. Pinot Blanc and Pinot Gris are tank-fermented, as is some Chardonnay. Most fermentations are "native", not using inoculated yeast, and they let malolactic fermentation take place without inoculation as well. Rhône reds are aged in 500-liter and 600-liter puncheons. Michael proceeded to taste us through quite a few barrels from both '06 and '05. The Demetria wines showed a combination of excellent fruit sources and a light touch on the winemaking style – nothing seemed over-extracted or over-oaked. Should be another new winery to watch. Brad & Maureen were staying with Peter & Rebecca Work at their beautiful home overlooking Ampelos Vineyard, and the Works graciously invited Al and I to join all of them for dinner that evening. 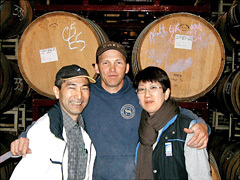 Also joining us were the Work's son Don Schroeder (the assistant winemaker at Sea Smoke) and Don's wife Lindsay. It turned out to be an excellent experience on the climate of the Santa Rita Hills. Several of us stood outside the house as Peter grilled up some delicious food on the barbeque, while strong late afternoon winds whipped cool marine air through the valley. Once the sun began to set, the wind died down but the temperature dropped rapidly and sent us inside to grab coats and sweatshirts before venturing outside again. The Works pointed out that this is the typical weather pattern in the area, and part of what makes it so well-suited for growing cool-climate grapes like Pinot Noir. A group of us met for breakfast on Wednesday in Lompoc at the café formerly known as Hi's, now the Jalama Beach Café. After a hearty breakfast, we were ready to hit the road. The annual pre-HdR festivities begin in earnest on Wednesday with tours and tastings in the Santa Rita Hills area. As a change of pace from our usual relentless wine touring, Peter Cargasacchi arranged for a group of us to tour the Celite diatomaceous earth mine just south of Lompoc. If you've ever driven along Santa Rosa Road from Buellton to Lompoc, you can't help but notice the nearly-white color of the roadcuts along the way. 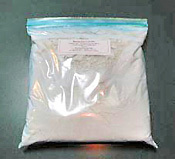 This chalky diatomaceous earth (or diatomite, or DE) is widespread in the area, and is the result of the fossilized remains of single-cell organisms called diatoms that inhabited the oceans millions of years ago. As ocean floor sediments were lifted up to form coastal California, the Lompoc area became home to the world's largest known deposit of diatomite. 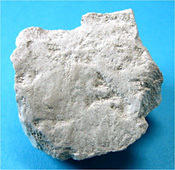 Mined and processed at the Lompoc facility, we learned that refined diatomite has many uses, but is most widely used for filtration of everything from beer to swimming pools to pharmaceuticals. Our group donned hard hats before hopping into several Celite vehicles to venture out to one of the areas being mined. The soft, lightweight, and blindingly white diatomite contrasted with veins of hard, sharp chert that streaked through the surface. After the large deposits are removed, they are re-covered with topsoil and replanted. It was a fun and educational tour, and we got to see some cool giant trucks too! Wonder what Peter C. will plan for us next year? Melville: Mt. Eden clone, 50% whole cluster, black cherry, spicy, tannic, will go into "Terraces"
Hosted by Melville Winery, this has become an annual pre-HdR event, and there is always a fantastic selection of cheeses along with the Pinot barrel samples. This year, there were wines from Loring, P2, Pali, Cargasacchi, Hitching Post, Carlson, Alta Maria, Native9, Presidio, Melville, Summerland, and Lea. Looking through my notes for this tasting, I see "spice" and "spicy" a lot. Seems like the '06 vintage will have a lot of wines with this character – maybe a feature of the vintage but I think also at least partly due to more wineries using some whole cluster fruit in their winemaking. After the barrel tasting at Melville, most of the group drove north to Paso Robles for the annual "Pinot Pirates" dinner at Villa Creek Restaurant. Organized as usual by Augie Hug, and featuring the delicious food of Villa Creek chef Tom Fundaro, this Pinot-themed dinner is one of the highlights of each year's pre-HdR festivities. Most people I spoke with agreed that this year's dinner was one of the best yet – the duck charcuterie plate and the rack of lamb with risotto in particular were exceptional. And of course everyone at the dinner brought some wonderful Pinots to enjoy with the food. 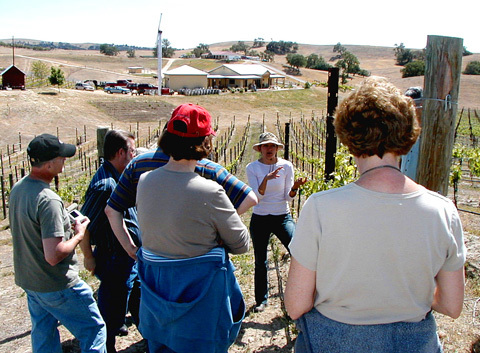 Thursday morning, a small group of us headed out to Jack Creek Cellars, just north of Highway 46 on the west side of Paso Robles. The 1,100-foot elevation of the vineyard, and its location in the cooler Templeton Gap area, allow it to grow Pinot Noir in a region that's usually considered too warm for that variety. We were met at the winery by Doug & Sabrina Kruse, owners of Jack Creek. Doug and Sabrina bought the 75-acre property in 1997 and planted their vineyard the following year with Chardonnay, Pinot Noir, and Syrah. Pinot clones planted include 115, 2A, Pommard 5, 667, 828, and 143. Some Grenache has been planted recently but is not yet in production. 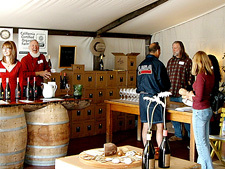 Jack Creek's wines are all from estate fruit – about 30 acres are currently in production. The vineyard is in a windy, hilly spot, on calcareous soil. All of the vines are trained on a vertical shoot positioning trellis system. The winery building, adjacent to the vineyard, was completed shortly before the 2006 harvest. Earlier vintages were produced at Linne Calodo and Chateau Margene. '05 Chardonnay: tank-fermented and barrel-aged, using about 10% new oak, this had citrus and apple aromas and good acidity, with no significant oak influence. 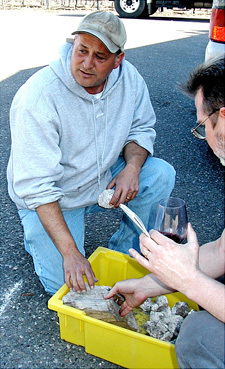 Doug described his winemaking as "New World style". 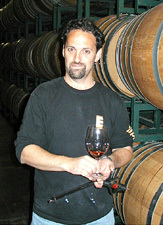 He had been a home winemaker before learning commercial winemaking from Justin Smith, Matt Trevisan, and Stephan Asseo. Techniques include a cold soak of about 24 hours, a combination of native and inoculated yeasts, 10-21 day fermentations, and use of a small basket press. Pinots are aged for about 16 months in a variety of oak barrels, mostly François Frères, and averaging around 35-40% new barrels. It must have taken some courage to plant Pinot Noir in the Paso Robles AVA, even in the relatively cooler area where Jack Creek is located. Doug & Sabrina are off to a promising start – the wines are good, and they should continue to improve as the vineyard matures. Another break from wine-tasting! We headed up Vineyard Drive to Willow Creek Olive Ranch, home of Pasolivo olive oils. Owned and operated by the Guth/Yaguda family, the facility produces a variety of award-winning oils, all from estate-grown olives. We were greeted by the family dog, Olive, and headed inside the building to meet Joeli Yaguda, who guided us through a tasting of the full line of olive oils and a tour of the small facility. The oldest trees on the ranch are about twelve years old – it takes about 5 years from planting before the trees produce a commercial crop. Close to a dozen types of olives are planted, mostly Tuscan varieties. 45 acres are currently planted, and 74 tons of olives were harvested in 2006, producing about 3,000 gallons of olive oil. The olives are all harvested by hand, and generally pressed within three hours of picking. Pasolivo's press can process about one ton per hour. The olives are pressed only once, with remaining material going into compost. 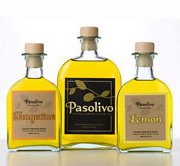 Pasolivo also produces tasty tangerine, lemon, and lime flavored olive oils, made by pressing citrus oils along with the olives in the mill. After finishing our tour and thanking Joeli for her hospitality (and after a long game of fetch the tennis ball with Olive), we relaxed for awhile to enjoy lunch at the small picnic area next to the tasting room. After lunch, we drove to the east side of Paso Robles for our last appointment of the day at Ohana Vineyard. Located in the Creston area, near the eastern end of the Templeton Gap, the ten-acre vineyard is planted with Grenache, Mourvèdre, Syrah, and Tempranillo. Linne Calodo buys Mourvèdre from the vineyard, while Villa Creek buys Tempranillo. 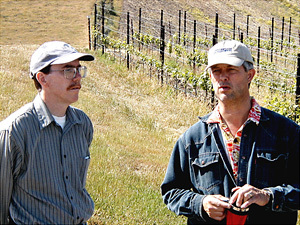 Simon & Hilary Graves own the vineyard, which was planted in 2002. A bed of limestone is only about 12 inches below the topsoil. Most of the vines are trained to vertical shoot positioning with unilateral cordons, though some Tempranillo is being retrained to bilateral cordons, and there is some recently-planted head-trained Syrah. The Grenache at Ohana Vineyard is 187 clone and the Tempranillo is Valdepeña selection. Early Syrah clone 877 plantings fell victim to "Syrah Decline" or "Syrah Disorder", a vine condition that is not yet well-understood. More recent Syrah plantings have been Estrella clone. '05 Mourvèdre: deep plum fruit aromas, earthy, big and rich, layers of flavors with moderate tannins and a long finish: outstanding wine! '05 Villa Creek "Mas de Maha" (60% Tempranillo, 25% Grenache, 15% Mourvèdre): from Cris Cherry's Villa Creek Cellars, the Tempranillo component of this wine came from Ohana Vineyard. Deep, ripe berry aromas, moderately rich mouthfeel, touch of sweet oak. We walked the hillside vineyard with Hilary. As we walked up the edge of the vineyard, she pointed out an owl box above us and noted how effective the owls have been in keeping down the population of pesky burrowing critters. Apparently we were being a little too pesky ourselves, as an owl suddenly emerged from the box and soared across the vineyard to a box at the other side. Hilary has a degree in Library Science and became interested in viticulture after working at a university viticulture and enology library. She began studying viticulture herself and is now highly-regarded in her field. Hilary's discussion of the vines during out vineyard walk was very informative, particularly her views on canopy management. Heading back into the house, we tasted a number of Graves wines (produced at the Denner Vineyards facility). Most of the Graves wines to date have been made with fruit purchased from the nearby Camatta Hills Vineyard in Creston, which Simon manages. After thanking Simon & Hilary for their hospitality, we all drove back to Paso Robles in time to freshen up for dinner at Ristorante da Gaetano…..lots of fine food, wine, and friendship ensued. Friday and Saturday were taken up with the official Hospice du Rhône tastings, seminars and other events (though I only went to the Friday Library Tasting, and helped pour for Eno Wines at the Saturday Grand Tasting). Then there was Mel Hill's annual barbeque at the Black Oak Lodge on Friday night – always a great time and way too much food and wine (is that possible?). And Saturday night was our third annual dinner with Casey Hartlip (of Eaglepoint Ranch Vineyard and Winery), Larry Roberts (of Redline Wines), Sasha Verhage (of Eno Wines), spouses and friends – at Artisan Restaurant this year, back where I had started the week's festivities. Again, lots of fine food, wine, and friendship ensued. Several of us ventured out on Sunday morning for breakfast at Panolivo Bistro (where we ran into Jonathan Lachs & Susan Marks of Cedarville Vineyard) before we all went our separate ways back home. It was a week of non-stop food and wine, a bit exhausting but worth every moment. As always, thanks to everyone that we visited for being so generous with their time and their wine!